The 21-Foot Rule has been taught in Police Academies around the United States for decades, but it has never been tested scientifically - Until Now. An NBC Bay Area Investigation into the number of police officer deaths at the hands of suspects wielding knives or other sharp objects is raising serious questions about police training. Critics say a training drill, called the “21-Foot Rule,” resulted in the unnecessary deaths of thousands of citizens in confrontations with law enforcement. The “21-Foot Rule” is meant to deal with the perceived threat of suspects with knives. 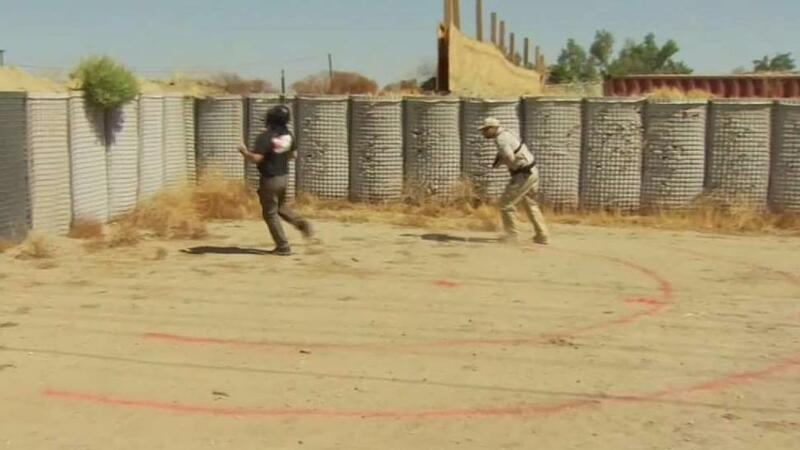 It’s based on police training drills that were run in the early 1980s by the Salt Lake City Police Department. Officers there found that a suspect could cover 21 feet in the same time it takes a police officer to draw and fire a holstered weapon. But that so-called “rule” has not been tested scientifically - until recently. At an outdoor firing range in Corona, California, Dr. Ron Martinelli and his team scientifically study what happens when suspects with knives threaten police. A former San Jose police officer, now a criminologist, Dr. Martinelli has run hundreds of these drills over the past year, testing a wide variety of officer skill sets, from rookie cops all the way police veterans. He’s even measured the reaction time of US Navy Seals. In fact, for more than a year now, Martinelli has written about his research, calling the “21-Foot Rule” a myth. Dr. Ron Martinelli has been testing the 21-Foot Rule for the past year. Instead of following the 21-foot rule, Martinelli says police officers should slow down and stay further away from some suspects. He also warns that shooting an attacker, even in the chest, may not stop him. That might be true in theory. But in reality — on the streets across America, where FBI statistics show an average of 56,274 assaults on police officers every year, the numbers show that fatal knife attacks in which suspects charge police from a distance of 20 feet or more, just do not happen. “The 21 foot rule exists only as an urban legend,” said Dr. Franklin Zimring, a UC Berkeley Law School Professor. Dr. Zimring has reviewed thousands of encounters between police officers and suspects, including 275 specific cases involving knives or sharp weapons. Dr. Franklin Zimring, author of "When Police Kill," believes police training could save lives, and make policing safer, by doing away with the 21-foot rule. “The threat that the police officer faces (when a suspect has an edged weapon) is not a threat to the police officer's life,” said Zimring. His research into this phenomenon resulted in a book he published in 2017, “When Police Kill.” Zimring found similar results for police officers working in Europe. “The number of cases we found...of somebody with a visible weapon charging at a police officer actually killing the police officer in the United States was zero.” Zimring said. FBI data backs him up. According to the FBI’s LEOKA, or the Law Enforcement Officers Killed and Assaulted program, two police officers died from knife attacks in hundreds of assaults over ten years. Those deaths resulted from attacks in close quarters. The suspect who killed the officers was not 10, 20 or 30 feet away. Other data – after close examination – shows similar statistics. The National Law Enforcement Officers Memorial Fund data reports that in those same ten years, 12 officers died from knife attacks. But after eliminating attacks which took place in U.S. prisons or jails, which are very different scenarios than policing on the streets – the data looks very close to the FBI’s LEOKA statistics: two deaths of officers. Lieutenant Joseph Szczerba was stabbed while apprehending a suspect in New Castle, Delaware. Officer Steven Green was fatally stabbed in Mobile, Alabama when a suspect escaped from his handcuffs and stabbed him with a knife. Those cases underscore the dangers of apprehending suspects, but neither of them involves a suspect charging at an officer with a knife. In data covering more than a decade, there is not a single case of a knife-wielding attacker rushing and killing an officer from a distance in the United States. Based on those numbers, Dr. Zimring is convinced that any mention of the 21-foot rule should disappear from police departments across the country. “If I were a police chief I would erase it from the weapons training manual today,” he said. While that is happening in many police departments, it’s not happening everywhere. NBC Bay Area surveyed 50 different police agencies in the Bay Area. Three agencies told us they continue to teach the 21-foot rule in their training.Nine others teach it as a concept only. A majority no longer teach it. Several law enforcement agencies told NBC Bay Area unprompted that the 21 Foot Rule was outdated, unreliable and not based on science. “We do teach it as a concept,” says Sergeant Steven Pomatto, training director at San Francisco’s police academy. While many other factors are considered at SFPD, he says the 21-foot rule is used as a guideline or concept for training officers how to approach a situation dealing with subjects holding knives and other sharp weapons. “This is the safe distance that you need under a certain skill set to be able to discharge a firearm in a certain scenario at a distance.” said Sgt. Pomatto. Even after learning about the new data Sgt. Pomatto insisted suspects with knives could still pose a real threat to officers. Those steps include teaching the principles from Ron Martinelli’s research. Those include remind officers to slow down, create distance and find cover when dealing with armed suspects. “We need to constantly retrain officers on field craft such as this,” said Martinelli. “Teach them how not to get so captured by the moment. You don't always have to make an arrest you don't always have to put your hands on people.” Martinelli has been sounding the alarm that police academies need to change the focus of their training. “If we can teach officers new skills by this research...we can save some lives,” he said. The NBC Bay Area Investigative Unit’s data shows 30 people wielding knives or other sharp objects have been killed by officers in the bay area since 2001. Dr. Zimring says it’s up to police chiefs to change the training and dispel what he and others call “the myth” of the 21-Foot Rule.